Built as one of Phoenix's first resorts in 1929, the Arizona Biltmore, A Waldorf Astoria Resort was constructed in grand form by brothers Albert, Charles and Warren McArthur. Throughout its colorful history, this acclaimed landmark has been graced by U.S. presidents, celebrities and world travelers. 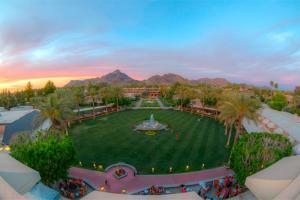 Arizona's historic Grand Dame radiates an undeniable mystique of refinement and splendor. Each of the luxurious 738 guest accommodations offers modern amenities while reflecting the hotel's timeless heritage.